Defiance, Ohio - political southern-influenced punk rock. We sat down pre-Fest to chat with Geoff, guitarist and vocalist. Scene Point Blank: I'm going to start with some Fest questions, since that's at the heart of this piece. How many Fests have you played? Geoff Hing: I want to say this will be our third or fourth fest. It's hard to keep track because we haven't played every year since our first one. Scene Point Blank: Do you have a "Greatest Fest Memory"? Geoff Hing: I don't have any really epic memories, but I had a really good time playing kickball last year and meeting nice people from all over. 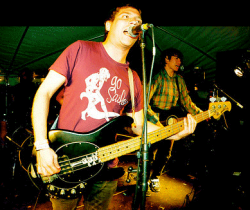 I remember seeing Bitchin' play the first Fest that we played and just thinking they were really awesome. I had a lot of fun improvising really strange thrift store Halloween costumes one year. 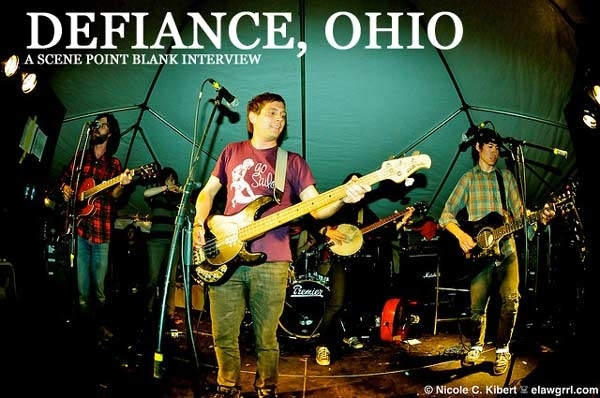 Scene Point Blank: How many of the band's other projects are also playing Fest? Geoff Hing: Landlord, a band that Will plays bass in is playing at Boca Fiesta on Sunday. Theo is playing solo songs on Saturday at the Civic Media Center. Scene Point Blank: How are you getting to Gainesville? Are you touring? Geoff Hing: Ryan, Theo, and Will are all touring with other musical projects. Bz and I are flying. We did a short but awesome tour at the beginning of the fall and then I had to go back to Chicago to finish up school, so we're not touring to the Fest. Scene Point Blank: What are you studying? Are you almost finished? Geoff Hing: I'm working towards a masters degree in journalism. I'll be done in December. Scene Point Blank: Since the band members aren't based in the same city, how has touring changed? Does the full band go, or are only some members available? Geoff Hing: Throughout the band's existence, a lot of us have lived in different cities. Even now, Theo lives in Athens while Bz, Ryan and Will are all in Bloomington, but he's really involved in setting up tours, writing songs and all other aspects of the band. I'm not as much, largely because of going to school and just feeling like I'm in a separate world from music that takes up a lot of time right now. I've been away for parts of recent tours, but that's been the case for Sherri and Will in the past too. So I don't know how much it's changed overall – it's just changed for me. Scene Point Blank: You recently played a couple shows with Bouncing Souls. How was that? Geoff Hing: It was pretty interesting. One thing that really struck me was getting to the club and just realizing how many people were involved with the show. It was a big production to have three bands load in, get set up, do a sound check if there was time and then to see all the club workers getting ready too. It was sort of exciting, but it was also strange that for a lot of people, it was just another day at work. Folks in the Bouncing Souls and The Great Explainer, the other band that played those shows, were nice but, because the shows were in cities where we all had a lot of friends, it didn't really feel like we had time to hang out. It also felt strange to be separated from the audience, either by a barrier or by the height of the stage or the brightness of the lights. Scene Point Blank: How do you like playing bigger shows like that? Is it harder to get the proper acoustics for your instrumentation, or doesn't size affect that? Geoff Hing: Well I'd say the instrumentation isn't the biggest concern. There are challenges to how things sound, especially when there isn't time for sound checks, but there are different challenges with getting things to sound good in a basement too. It's nothing new. I think the biggest change is just being so disconnected from the audience: whether it's by a barrier, the height of the stage, or just not being able to see the crowd because of the lights. We played on this giant stage to a pretty big crowd at this benefit in Chicago called Brew Not Bombs that some of our friends set up. It was in this neat, giant old theater so that was cool, but it was really hard to see the audience or to feel connected. At one point, there was some violence between security and someone in the crowd and the disconnect made it really hard to figure out what was happening and what we should do about it from on stage. Scene Point Blank: Were you able to figure out what happened, or did you just move on? Do you think there's a way to avoid that disconnect without playing on the floor itself? Geoff Hing: Not until after we played, and even then it wasn't entirely clear to me. During our set, we acknowledged that something was going on, and I made sort of a vague "cut it out" kind of statement, but I don't know how useful that was. Scene Point Blank: Do you think there's a way to avoid that disconnect without playing on the floor itself? I don't think the disconnect is just a function of tall stages or lights. When it's a big, crowded space, it's hard to assess everything that's happening in the crowd, even if you're at ground level. I think that just having a situation where people feel accountable to one another, to the people setting up the show and to the space helps everyone - us included - feel more connected. Words by Loren on Nov. 3, 2010, 7:55 p.m.
Posted by Loren on Nov. 3, 2010, 7:55 p.m.
Posted Aug. 22, 2012, 9:05 a.m.
Posted Aug. 7, 2012, 10:43 a.m.
Posted July 3, 2010, 2:13 a.m.